Garbine Muguruza has been going through tough times on court. The Spanish tennis star has calost six off her 14 matches this season, with her latest result being a second-round defeat at the BNP Paribas Open in Indian Wells last week. 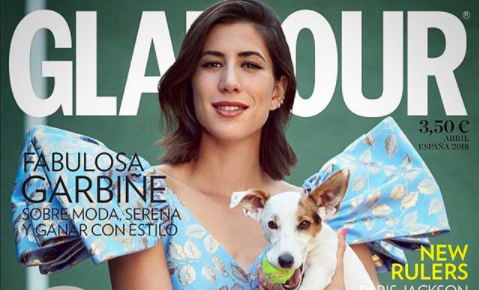 Shrugging off the rough patch, Muguruza took some time off to pose for the cover of Glamour Spain magazine. The 24-year-old later took to her official Instagram account to share a picture with her 626,000 odd followers. In the picture, Muguruza can be seen wearing a majestic blue ensemble. She can also be seen holding a dog in her hand. A ball in the canine’s mouth ensures that the snap has a flavor of tennis as well. “Loving this cover @glamourspain,” she captioned the photo alongside a couple of heart emoticons. Meanwhile, Muguruza, a two-time Grand Slam champion, is scheduled to return to action at this week’s Miami Open. She has a bye in the first round. Me encanta esta portada! Loving this cover @glamourspain ??????? ?